Art is and has always has been an extended part of nature and that art can effect social change. How does Dimopoulos’ life and artwork connect to, and invite us to reflect upon global issues such as deforestation, natural resources, sustainability, and the importance of environmental preservation? What might be the historical significance of Konstantin Dimopoulos’ life and work? What is environmental stewardship? How to become an activist? How can arts help save the world? Choose or devise practices to encourage students to be open to new experiences and ways of thinking in your classroom. Have the students first look at the forest on the ipads and experience ‘the trees’ from the ‘screen.’ The next day, have the students take their ‘sit upons’ and go to an urban forest close to the school. Each student is to find a spot and sit silently and mindfully for a while. Through this experience, the students learn to see the trees by being there and have a greater appreciation for the trees and connected with nature in a mindful way. By going back to the ‘sitting spots’ throughout the year, the students see the changes in the forest. Explore the breath and mindful breathing within ourselves. BIG IDEAS Anywhere educators: View The Blue Trees Video and encourage students to share their first impressions individually and in small groups. • View Guided Tour Video: View The Blue Trees Video again and talk about what new ideas have surfaced after class discussion. • Significant Aspects of the Artist’s Life & Work: Using the following PDF entitled About Artist and Artwork, Konstantin Dimopoulos website, the teacher creates stations detailing Konstantin Dimopoulos’s life and work. In small groups students rotate amongst information stations detailing the artist’s life and work. Station topics include the following: (1) education and training; (2) lifetime of artwork; (2) materials and processes; (3) beliefs and values. At each station, students answer questions and complete a task. For example, at the station “life’s work” students might plot the artist’s various installations on a map of the world. • Artist Themes – Environmental Stewardship: How does Konstantin Dimopoulos’s work reflect art can effect social change? Show students images of Konstantin Dimopoulos’s work in locations throughout the world. Students brainstorm possible preliminary answers to this question. Teacher records these and posts them in a visible area of the classroom. Introduce the three guiding questions: How does Dimopoulos’ life and artwork connect to, and invite us to reflect upon, global issues such as deforestation, natural resources, sustainability, and the importance of environmental preservation? What might be the historical significance of Konstantin Dimopoulos’ life and work? Reinforce that the purpose of this inquiry is to delve further into these questions and that answers and understandings are meant to evolve and change. Have students go outdoor and take a closer look at trees: the bark, the leaves, the branches. Consider learning activities such as bark rubbings, collection of soil samples, making leaf prints, and tree identification. Some useful tools include taking out the magnifying loupes and investigating and listening with a stethoscope. 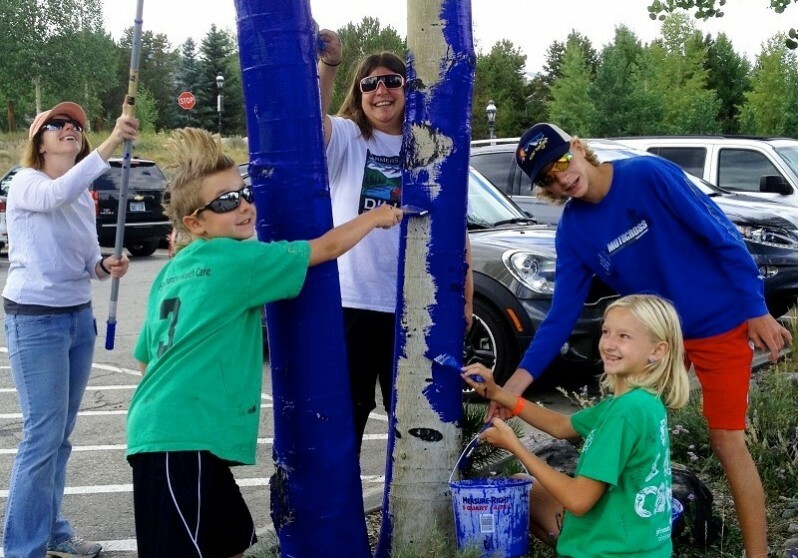 Engage students in some math lessons to think about height and circumference so that the students will have a solid base knowledge of trees in their minds before you take the students “outside the box” to think about the meaning behind The Blue Trees. This scientific approach is a good transition to talking about the colorant used in the project. Explain how leaves, buds, flowers, and thick moss or lichen are not coloured. Introduce terms such as buds, moss, and lichen, in addition to the parts of a tree and types of trees to the students. Learning Outcomes: 1. Describe and respond to works of art and explore artists’ intent. 2. Reflect on the creative process as an individual and as a group, and make connections to other experiences. Art-Making Activity: Ask students to select an item from nature such as a tree or grass and then change its colour. Students are to draw the item from nature and colour it in a different colour and write a paragraph explaining the significance of their art piece in terms of raising awareness for environmental sustainability. The teacher reads the picture book The Disappearing Forests by Janice Parker to the class. Explore the illusion of “deforestation happens somewhere out there” with the students. Get the students thinking and sharing about why forests are being cut down. Trace our daily uses of paper, furniture, and foods back to their origins in the forest. Extend the research and debate on the complexity and controversy of British Columbia’s resource-based forest industry, one on which the province was built. From our backyards to forests through the province, students can broaden their understanding globally to investigate/map the forests of the world and any conservation efforts. Reflect on how artists like Konstantin Dimopoulos can raise awareness of social issues through public art. Art-Making Activity: Have students work in pairs to make their own picture book about deforestation. Learning Outcomes: 1. Apply oral language to explore and express ideas, communicate with others, and contribute as a member of a classroom community. 2. Explore a rich variety of texts, including narrative, to deepen learning and develop a broader understanding of self, family, community, and the world. 3. Understand the role of forests in ecosystems and in the industrial world. The teacher reads the book Forests for the Future by Edward Parker. Hold a class discussion on What is the role of forests in our ecosystems? What do forests provide to our industrial world? Students write their ideas on a graphic organizer, and the teacher facilitates any further exploration on the significance of forests. Art-Making Activity: With students in table groups, have them brainstorm ideas of how to make forests of the future more sustainable, and draft a plan with a drawing to represent their ideas. Each group presents and explains its finished product to the class. Learning Outcomes: 1. Express ideas, thoughts, feelings, and opinions through various forms of communication. 2. 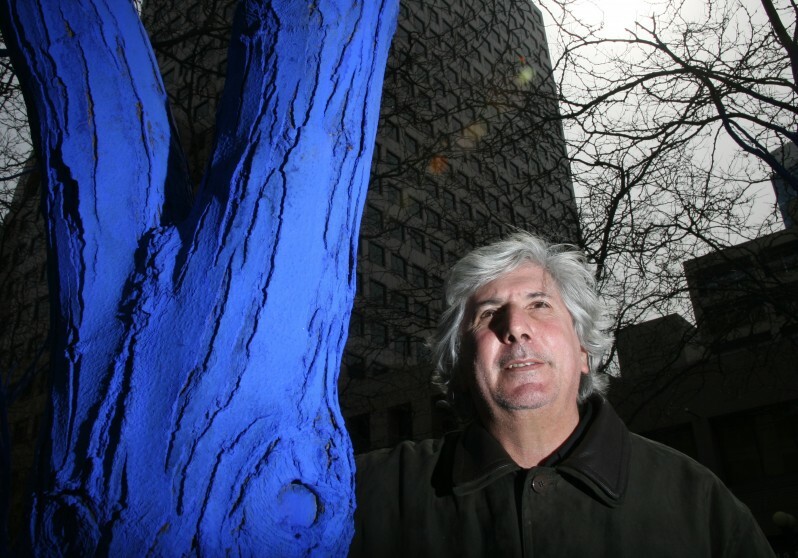 Apply prior and learned knowledge about The Blue Trees to create and present a group product. Activate prior knowledge: Teacher asks students to make a list of the things they already knew about trees. Watch the PBS video “203 Blue Trees” and “Blue Trees” video produced by Miranda Anderson, a secondary school student from Coquitlam. Ask students to make a list of things they learned from the video. Each student writes down on a sticky note one key point he or she learned from the video. Students walk to another person in the room and share their thoughts. Digital Art-Making Activity: In small groups, students use Glogster to create a digital multi-media poster to convey the key concepts in the video. Class Share: Each group presents its poster and explains the significance of its poster in relation to environmental sustainability and Konstantin Dimopoulos’s work. 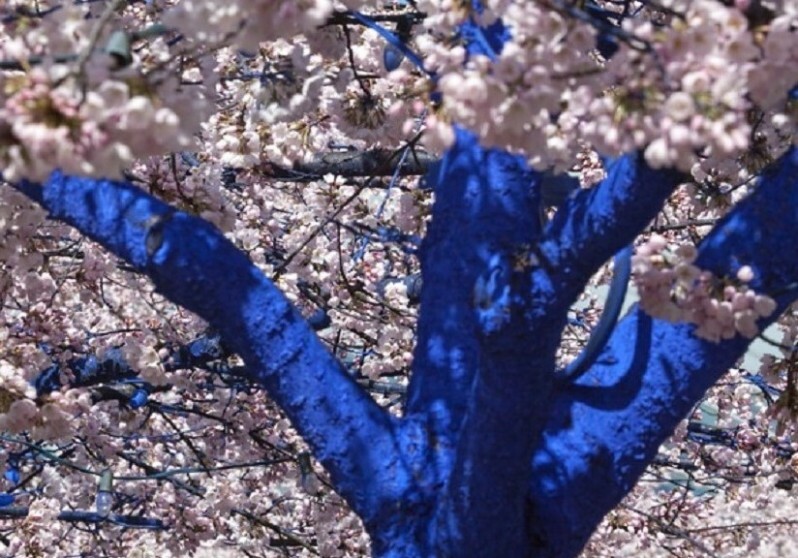 Alternatively, students can create a mural of The Blue Trees in the classroom with 2D drawing or 3D sculptures. The students can present what they have learned about the trees. Learning Outcomes: 1. Appreciate the universal importance of story in Aboriginal and other cultures. 2. Make a personal connection with artwork and themes. Teacher reads chapter one from the book Aboriginal Peoples and Forest Lands in Canada, edited by D. B. Tindall, Pamela Perreault, Ronald Trosper. Art-Making Activity: Students draw a picture representing at least one of the main ideas from the chapter. Randomly select students to present and explain their drawing to the class. Activating prior knowledge and learned knowledge: After watching the video The Forest in the City – Vancouver Canada, hold a class discussion on: What is your experience with forests? Why do you think forests are beneficial for humans? 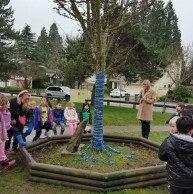 Students are asked to think about The Blue Trees and forests and make a mind map making personal connections to the artist’s work and themes (such as deforestation, natural resources, sustainability, and the importance of environmental preservation). Ask students to share their mind map with a partner. Students are split into groups of four to five. Students are instructed to select an environmental issue such as deforestation, natural resources, sustainability, or environmental preservation. Students create a 2-min public-service announcement to raise awareness about one of the issues. Groups film their public-service announcement and submit it to the teacher. Create a film festival to showcase student work and share with the extended community of parents and other students in the school. • Language Arts – Expressing a Persuasive Argument: Students write a persuasive paragraph presenting reasons why people should stop deforestation and create a presentation using programs such as Microsoft Powerpoint or Prezi to present their arguments to the class. • Science and Mathematics: Refer to the Looking at Trees from a Scientific Approach – Anatomy, Biology, Ecology in the Inquiry Challenge section for details.